Your Journal is essential, of course, but CaringBridge can lighten your load in lots of ways. Below is a round-up of favorite features, and how to use them, as identified by those who know best — your fellow CaringBridge authors. Bills keep coming, no matter where you are in your health journey. To help with healthcare expenses, many CaringBridge authors choose to set up personal fundraising campaigns. CaringBridge makes this easy, through a partnership with GoFundMe, although other online fundraising platforms are available. 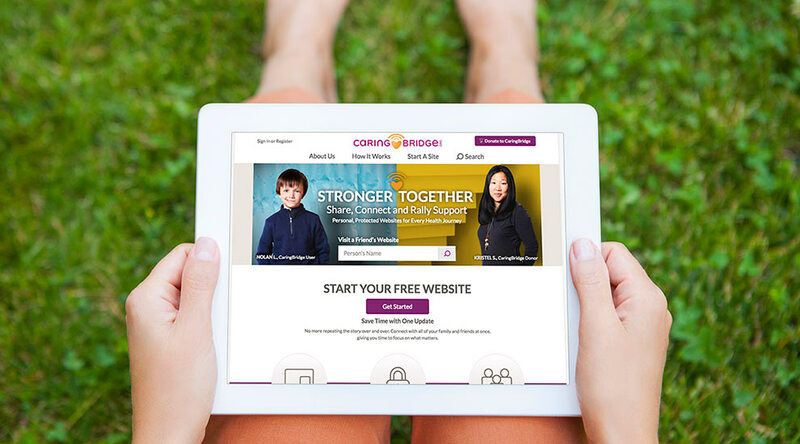 If you choose to set up a GoFundMe or other personal fundraiser campaign, you may connect the campaign to your CaringBridge website in Ways to Help. Then you only have to share updates once. And, if a family member or friend has already established a personal fundraising on your behalf, you include the link in a Journal entry to help get the word out. Write a Personal Message that visitors will see at the top of your Ways to Help page. This may include anything from when to visit and favorite foods to special events. You may update the message as often as you'd like. When a friend or family member comments on your Journal updates, you or anyone can respond to that comment. If you would rather not have the ability to reply to comments on your Journal updates, you can turn this feature off in your site settings. Using Safari on your iPhone or iPad, open the CaringBridge website. When the page has finished loading, select the "Share" button, which appears at the bottom of the iPhone screen and the top of the tablet screen. Select the option "Add to Homescreen." Another screen will appear where you may type in a name for the CaringBridge icon. When you are ready, tap the "Add" button in the top right corner of the screen. Any time want to visit your CaringBridge website, simply tap the icon on your homescreen. 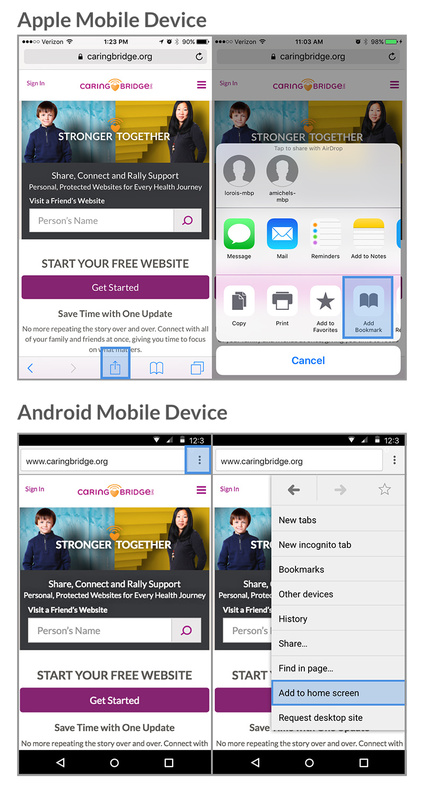 Using Google Chrome on your smartphone, open the CaringBridge website. When the page has finished loading, select the "Menu" button, and select from the options "Add to Home Screen." You may rename the CaringBridge icon if you'd like. When you are ready, tap the "Add" button. Now you are able to visit your CaringBridge website by simply tapping the icon on your homescreen. We've introduced new features to CaringBridge so you can easily access and manage all of your information in Site Settings. Learn how to add your own Cover Photo and how to see who has visited your site. You are in full control of your privacy options at CaringBridge. You may make adjustments to these options as often as you’d like, by clicking "Site Settings," followed by "Privacy." At any time, you can choose to widen, or limit, visitors to your website. You can enable family and friends to invite visitors to your website. You may allow visitors within CaringBridge to find your website simply by typing in your first and last name. Some authors opt to have their CaringBridge websites searchable on Google and other search engines. If you'd like to see who has visited your website, you may view or download site activity reports. To learn about the features of a CaringBridge website and how it can make a health journey easier, view the How It Works page.